At Peace we seek to share our gifts, talents and resources in a variety of ways that meet our congregation’s passions to Give & Serve. Check out some of the ways we do God’s important work together. Join us as we live out our mission of “Growing disciples who Welcome, Worship & Walk with Christ.” At All Ministry Night we gather for devotions & prayer and then break into teams to do the planning and visioning for ministry. All are welcome as we work and serve together. To benefit Neighbor for Neighbor Food Pantry in Tomah WI. 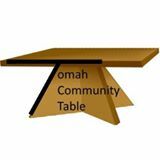 Throughout the year we serve as a congregation at the Tomah Community Table to provide a meal and fellowship for those in need. *Contact Peace if you’re interested in helping with this meal! Join us for a day of worship, service and fellowship as we go out into our community to care for the needs of our neighbors. We start with worship and then head out into the community to serve our neighbors and many organizations around Tomah. After serving we gather again for a potluck lunch. Projects are for all ages and abilities. All are welcome! At Peace we encourage members to consider using our online giving program called Simply Giving. This is a great way to continue your offering to God. No more forgetting your envelopes. No more mailing in offerings when life gets too busy. Contact the office for more information about Simply Giving.